Fantastic!!! Like it!!! Good price, friendly workers, good room, delicious breakfast!! Good place!! Strongly recommended!!! Cleaning room, continental breakfast fantastic, friendly workers, and good price. This was a great value and a great vacation. I got to check in 3 hours early, which was fantastic. The front desk was wonderful and told us how to use the I-trolley and it was fantastic. The location, the service, the convenience of having your own kitchen, the pool, the Breakfast, fabulous. Convenience of full kitchen, the pool was very kid friendly, the I-trolley was the bomb and so easy to use. The arcade could use a little more "small" children games. I spent $130 my first night in town at the Wyndamm inn on international drive. It was nice, but didn't even come close to this hotel. The rooms were spacious and felt brand new. And for the price, which included a complimentary breakfast that saved me $50, it was fantastic. The pool was beautiful as well. The only downside is being 5 minutes from international, rather than right on it, but to me it's worth it. This hotel was well worth the money. 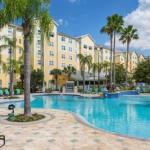 The 350 all-suites Residence Inn Orlando - Sea World International Center is an award-winning hotel catering mainly to families on vacation. The pet-friendly, six -story hotel provides complimentary theme park transportation. Other items include with the room rate are a hot breakfast buffet, high-speed Internet access, local telephone calls, parking and coffee available in the lobby 24/7. 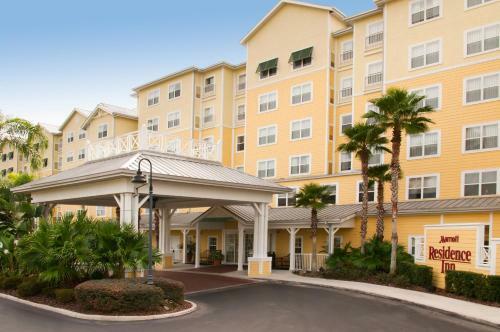 Attractions close to the property include Universal Studios, SeaWorld, Discovery Cove, Walt Disney World, and Orlando Premium Outlets featuring upscale shopping at over 120 stores. The non-smoking hotel has two meeting rooms for business or social functions. The larger can accommodate 120 guests. All the suites have a fully equipped kitchen with refrigerator with icemaker, conventional and microwave oven, dishwasher, stove, toaster and silverware and crockery. Other features are a work desk with ergonomic chair, high-speed Internet access, dual-line telephone with voicemail, cable television with news and movie channels, pay-per-view movies, pullout sofa bed, alarm clock, tea and coffee making facilities, iron and ironing board and a hairdryer. This inn has an outdoor heated swimming pool, whirlpool, an exercise room and sports court. The hotels Castaway Bay Poolside Bar and Café is open throughout the day serving pizzas, sandwiches and tropical drinks. There are numerous places to eat close to the property including a Bennigans, the Boardwalk Sports Bar and a Steak and Ale. The hotel offers a grocery shopping service and the 24-hour front desk has safe deposit boxes. Other amenities include a concierge desk, games room, copy and fax services, an ATM, a coin-operated laundry, picnic area with barbecue grill, valet dry-cleaning vending machines and a gift shop and newsstand. The bright Caribbean décor, friendly service, fully equipped accommodation, affordable rates and a great location next to SeaWorld and Universal Studios: These are the reasons families enjoy this inn. Not surprisingly, the hotel has won awards for being the best hotel for families in the U.S. The fact that so many travelers return to this inn is a great recommendation.